Lanier’s words, written in 1997, were prescient. Today, a decade and a half into the 21st century, this transformation is well underway, even if her vision has yet to be fully realized. The professional expectations for today’s teachers are undoubtedly high. They must work to prepare students for new economic realities, use new and innovative pedagogical techniques and technologies, adapt their instruction to meet students’ increasingly diverse needs, and adjust to recent policy reforms that directly affect their practice. These changes have reshaped teaching, making it a more difficult and demanding profession. At the same time, however, research is demonstrating the powerful effect that teachers can have on student learning and illuminating the ways in which great teaching is more important than ever before. Unfortunately, the ways in which schools and school days are organized—and the ways in which school systems have been designed to train, support, and develop teachers—have not kept pace with the tectonic shifts in teachers’ daily realities, making it difficult for teachers to succeed in their profession. The public’s perception of teaching is equally out of date, preventing the full realization of Lanier’s vision to elevate the profession’s standing in American culture. According to a Third Way study, 77 percent of voters and 82 percent of teachers said that if we do not change the perception of the teaching profession, schools will not be able to recruit high-achieving young people into the classroom. A modernized teacher workforce is critical when it comes to improving academic achievement, moving toward educational equity, and ensuring the health of the national economy. In order to improve teaching and learning in the United States and keep up with changing demands on students, teachers, and schools, policymakers and education officials must make systemic changes to all aspects of the teaching profession: recruiting; training; developing; retaining; and supporting teachers with effective leaders and professional learning environments. Each of these pieces is interconnected and must be aligned in order for change to be effective. This work is possible. The remarkable growth of several nations from mediocre performance to the top of the list on international assessment results—including Finland, Canada, and Poland—has been widely attributed to their overhauls of their educational systems. These countries placed excellent teaching front and center—from recruiting, selecting, and educating teacher candidates to fundamentally redesigning the way schools operate and the way time is used to provide excellent ongoing training, significant autonomy, supportive working conditions, and opportunities to participate meaningfully in decisions that affect teachers’ practice once they are in the classroom. Some U.S. states and districts have undertaken similar efforts, but considerable change is still needed before these efforts can be considered systemic. Systemic change is critical for the future of the U.S. teacher workforce and the nation’s students. No simple policy fix will be enough to move the system as a whole, especially since so many of the institutions responsible for educating, training, and setting policy for teachers operate in isolated silos that are often disconnected from teachers themselves. Rather, the nation must take a comprehensive approach to improve all parts of a teacher’s career—beginning with the selection of a college major and continuing through retirement. This far-reaching agenda will affect not just how teachers are recruited and trained but also the fundamental ways in which schools are organized. These changes can set in motion a virtuous cycle by which better training and working conditions enhance the experience of being a teacher, attract more people into the profession, and elevate the status of teachers overall, thereby improving the profession. What follows is a progressive vision and policy agenda to achieve these goals that would ultimately make changes to every stage of the teacher career continuum and modernize the system as a whole. It is a transformation that begins with recruitment and selection into teacher preparation programs and continues on to new teacher training and support, professional development, compensation, and opportunities for career advancement. Ensure that teacher preparation programs select teacher candidates carefully and purposefully. In order to cultivate the best teacher workforce possible, teacher preparation programs must address the lack of selectivity fueling the false perception that teaching is not a career that will challenge and reward top students. This change must be made in conjunction with efforts to recruit excellent teaching candidates from diverse backgrounds. Require teacher preparation programs to improve coursework and offer higher-quality clinical training experiences. Once admitted into a teacher preparation program, prospective teachers should receive a rigorous and comprehensive education that prepares them for the challenges they will face once in the classroom, including through high-quality clinical experiences. In addition, states should be required to collect and publish data on the effectiveness of their teacher preparation programs, which would then allow states to develop a system for shutting down programs that are not adequately preparing students for the challenges of the classroom. Improve licensure exams to make them a more meaningful bar for entry into the teaching profession. Licensure exams must be improved and refined to ensure that they are rigorous and rooted in the kind of skills and knowledge that teachers need to succeed in the classroom. Raise teacher compensation to professional levels and differentiate pay according to effectiveness and leadership responsibilities. In order to recruit excellent prospective teachers into the field, teachers’ salary trajectories must be brought in line with those of other professionals, which means higher starting salaries; faster salary increases, especially for high-performing teachers; and the opportunity to earn more by taking on additional responsibilities. Invest in new teachers by supporting their professional growth early on. To improve the working conditions for beginning teachers, states should require districts to provide a more gradual on-ramp to a full-time teaching experience by offering high-quality induction programs, intensive coaching and mentoring, co-teaching models and experiences, teacher residency programs, and/or a reduced course load for beginning teachers. Redesign school schedules to support improvements in teacher practice. Following the models of high-performing nations, U.S. school districts should thoughtfully increase the amount of time teachers have available to improve their practice—time that could be spent observing highly effective teachers, collaborating and planning with colleagues, coaching, mentoring, and engaging in other forms of professional learning. Improve professional development by aligning it to the needs of students and teachers. 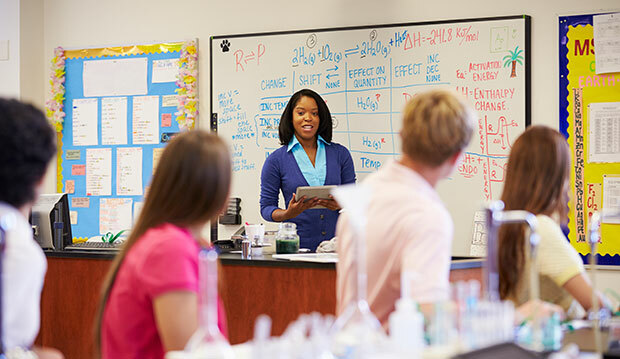 To ensure teachers are getting the kind of professional development opportunities they deserve, districts should be required to demonstrate how they are shifting their professional development dollars toward models that are designed to meet teachers’ personalized improvement needs, are aligned to high-quality evaluation systems, and are aimed at improving student learning outcomes. Provide more opportunities for teachers to assume leadership roles. 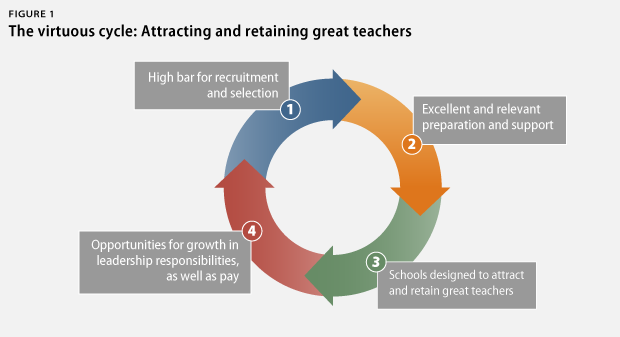 Career ladders and compensation structures that reward effective teachers who take on additional responsibilities within their schools with higher pay would bring teaching in line with other careers, where high performers can expect increases in salary and responsibility. Leadership roles could include mentoring new or struggling teachers; planning or facilitating professional development; observing teachers and giving feedback; or working with school leaders to hire new teachers or make decisions related to curriculum, instruction, or resource allocation. Reform tenure by setting a high bar for attaining it and streamlining due process. In order to bring the tenure process in line with the needs of the ever-changing teaching profession, due process protections must be streamlined and the bar for achieving tenure must be raised by linking it to teacher performance and extending the timeline for attaining tenure status. Ensure that school leaders receive training in how to support teachers. Motivating teachers, driving instructional improvement school-wide, providing objective and meaningful feedback, making thoughtful hiring decisions, creating a positive school culture focused on student learning, and supporting the development and advancement of their best teachers are all crucial aspects of school leaders’ jobs. Principals and other administrators must receive training and support in how to carry out these roles effectively. This report envisions a modernized teacher workforce made up of professionals who must compete for a spot in their preparation programs; work relentlessly to finish their clinical experiences with high marks; study late into the night to pass their licensure exams; and dedicate themselves fully to their craft so they can earn greater responsibilities, higher compensation, and tenured status. These changes, if brought to fruition, will establish a modernized and elevated teacher workforce. What’s more, these changes have the potential to transform the profession’s reputation and improve teaching and learning for millions of students across the United States. Authors’ note: This report guides the reader through a teacher’s career trajectory, beginning at recruitment and selection and continuing throughout his or her career. Our mission is to provide policymakers and the public with a forward-thinking document that proposes how to elevate and modernize the teaching profession. In this report, we argue that elevating the teaching profession cannot be solved by one policy change; instead, changes must be made to every step of the teacher pipeline. For this reason, we have paired each section—representing each stage in a teacher’s career—with its own recommendation(s). Carmel Martin is the Executive Vice President for Policy at the Center for American Progress. Lisette Partelow is the Director of Teacher Policy at the Center. Catherine Brown is the Vice President of Education Policy at the Center.